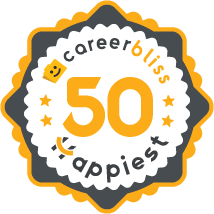 On average, employees at Citibank give their company a 4.0 rating out of 5.0 - which is 5% higher than the average rating for all companies on CareerBliss. The happiest Citibank employees are Interns submitting an average rating of 4.8 and Financial Associates with a rating of 4.4. "It's a good company and they offer lots of flexibility in working arrangements. People generally feel secure and remain for a long time. Lately, however, there has been a trend towards regular layoffs so it keeps some people, especially those employed a long time, on edge. If you like a heavy work load, it's a good place to stay busy." "Stressful, unprofessional environment; administrative chaos. Hard to grow on merits. Unethical behavior is the rule among management. Embraces diversity; decent benefits and salary." "SMS (citibank) was a great company to work for and they had very strong projects. The atmosphere had very good energy and upper management kept the lower staff in the loop with what direct the company was going in. They always kept staff with extra tools and resources to do your job well." "Due to government review of Citibank and having them to pay over 7 billion in restitution I would not recommend anyone to this company." "Great company to work for. Does have good internal opportunities." "I have worked for Citibank since 2013." "Very good and nice to work with the company like that." "Work 2 years Citi closed my branch." "I started in the finance industry with Citi, and worked there for approx. 1 year before venturing off into the world. 15 years later I came back to Citi. They had to be doing something right if my mother and stepfather both have worked there for 28 and 29 years. I would love to go back if I found the right opportunity!" "I've worked for Citibank since early 2013 and still work there now. Citi is such an open and culturally aware company that values its employees and provides excellent compensation through health and retirement benefits. The competitiveness in their pay is not the best, but it's enough to live comfortably. I would recommend Citi as a place to work if you are into bank work." "I worked for Citi for around 4 months. It's a good company." "I have been with Citi since 2011, started as a loan processor/closer level 3, and in April 2012 promoted to credit underwriter II. Citibank houses over 10,000 employees." "It's an awesome company to work with. I am glad to be part of it." "Citi is a strong company, always improving process to achieve quality, efficiency and cost savings. Salary ranges are average. Cost of living salary increases are below average." "I loved working here as it encouraged me a lot in doing my best."